The appearance of Citroën's DS3 at the end of each piece above is such anticlimax, especially as you feel yourself get drawn into the grit of the filming, the weight of the sounds. Icons this powerful, speech this rich, shouldn't be used for selling cars -- though to be fair, using them to sell anything is pretty much always a risk, riddled with critique. My heart breaks into a million little styrofoam pieces. 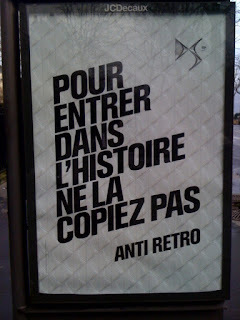 To penetrate history, don't copy it. Via fellow ad-mirer (and VP of hypios!) @jeremiebertrand. Totally agree with you, appearance of cars just breaks all the charm and the rythm of the ad. It still charms me, but yeah, you know... Lennon and Marylin... Anyway, the intro bluffed me! And street ads are great, yeah... of course cause you don't see the cars! I disagree. Keep in mind the original DS is in several museums and has been voted by even a group of top level designers as the best looking and most iconic car ever made. It has a strong historical status in France, one even saved Charles De Gaulle's life. I think the ads do a good job of playing off that legendary reputation. using retro footage to suggest something anti-retro. hmm. not sure i like this campaign at all. also, this is advertising nerdiness but i wish the music choice had been as forward thinking as the rest of the ad.